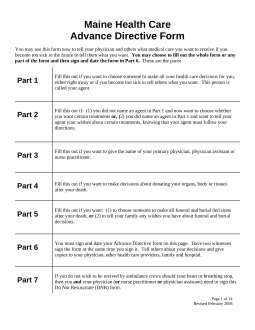 Maine Advance Health Care Directive (POA & Living Will) gives its users the opportunity to choose another person to make their health care decision in the event they are unable to do so on their own. In addition, the option to cover end-of-life preferences, burial arrangement, and other common concerns have been included on this form. You may also include a do not resuscitate order. Durable Power of Attorney – Allows a person to choose an agent to make their financial decisions. This directive may be opened using the buttons on the page near the image. Each one has been labeled according to the file type it connects to. Click on the button to open this form. It may be worked on with a form friendly browser, compatible software, or printed then filled out. The Principal granting approval for an Agent to make Health Care Decisions on his or her behalf will be able to declare such a person in Part One. First, in the area below the word “Note,” the Principal must self-report on some information. The statement beginning with “This is a list…” will contain ten blank lines. These lines have been provided so that each individual or entity the Principal will give a copy of this directive to may be listed. Part One will begin with the heading “Your Advance directive Begins Here.” Here, beneath the “Choosing an Agent” statement, the Principal’s Agent may be documented adequately for the purposes of this paperwork. On the blank line labeled “My Name,” the Full and Legal Name of the individual delegating the Power to make Health Care Decisions on his or her behalf to another individual should be recorded. The next blank line, “My Agent’s Name,” enter the Legal Name of the individual who will be granted to the Power to make Health Care Decisions on behalf of the Principal once this form is executed correctly. This entity’s name should be reported precisely as it appears on his or her personal Identification. Part 2 may be used to outline the Principal’s preferences in certain end-of-life scenarios whether an Agent has been named in Part One, though it is customary for the Agent to be fully informed of all the declarations made here. It should be noted, however, that an Agent will not be able to override anything said here. The next area will allow the Principal to record the Name(s) of his or her Primary Physician. The Principal may also name a secondary Primary Physician, Physician Assistant, and/or Nurse Practitioner to speak to before engaging in any treatment. Use the blank line labeled “Name of My Primary Physician” under the heading “Part 3 – Primary Physician,” to report the full name of the Principal’s Primary Physician. Make sure to report this entity’s Address and Telephone Number on the blank lines labeled “Address” and “Phone.” If the Agent cannot contact the Primary Physician listed or the Primary Physician is not available, a second choice may be named for the Agent to contact. On the second set of lines, use the spaces labeled “Name of Physician,” “Address,” and “Phone” to document a second choice the Agent may contact. If the Principal also wishes the Agent to speak to a specific Nurse Practitioner or Physician Assistant, then use the blank line labeled “Name of Nurse Practitioner or Physician Assistant,” “Address,” and “Date” to report the Identity and Contact Information of this party. The next part, “Donation of Body, Organs or Tissues At Death,” supplies a specific area for the Principal to disclose his or her Preferences regarding Anatomical Gifts at the time of the Principal’s Death.” This section is optional and provided for the convenience of the Principal. If the Principal does not wish to make an Anatomical Gift of his or her body, body parts, organs, or tissues then mark the box next to the words “I do NOT wish to donate any organs, tissues or parts” at the top of the page. If the Principal does wish to make an Anatomical Gift, he or she may document any preferences in the next area. If the Principal wishes to donate his or her entire Body, then mark the box labeled “I give my body.” If the Principal wishes to donate organs, tissues or parts, then mark the box corresponding to the statement “I give any needed organs, tissues or Parts. If the Principal only wishes to donate specific organs, tissues or body parts, then mark the box labeled “I give only the following organs…” The Principal may also declare why the Anatomical Gift should be made. If the Anatomical Gift should be made for the purposes of therapy or as a transplant, then mark the box next to the statement “My Gift Is For Transplant Or Therapy.” If the Principal is making an Anatomical Gift for Research or Education, then mark the second box. In this option, there will be a Name and Address line to document any interested entity the Principal wishes the Anatomical Gift to be donated to. 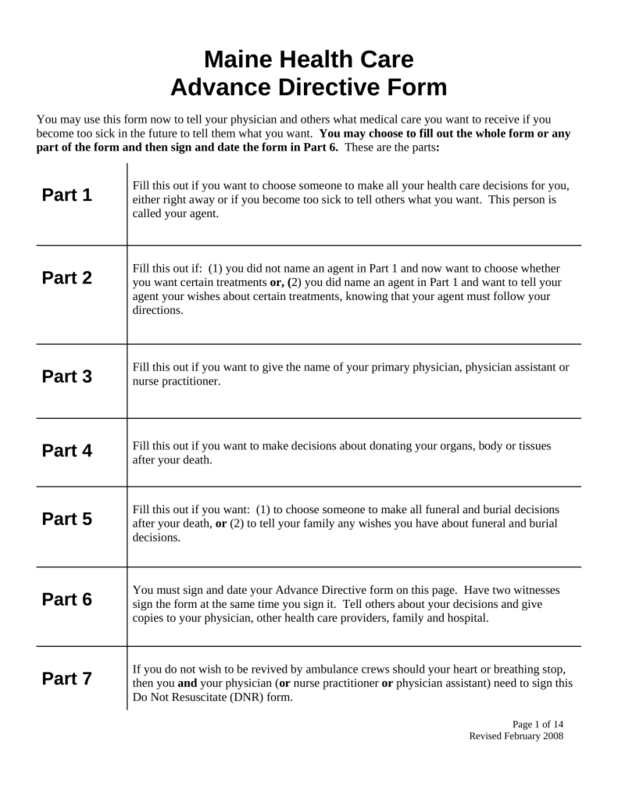 The next page, “Part 5 – Instructions About Funeral And Burial Arrangements,” will provide two choices to illustrate the Principal’s preferences as to what should happen to his or her remains. If the Principal wishes to name a specific individual to take custody of his or her remains, then mark the first box in this section then, enter the Full Name of the individual to take custody of the Principal’s remains on the blank line provided. If the Principal instead prefers to simply document his or her preferences, this may be done by marking the second checkbox and using the blank lines provided to report them. If there is not enough room, you may add more with the appropriated editing software or simply cite an attachment. Part Six will provide an area for the Principal and two Witnesses to satisfy this form’s requirements for execution. Locate the bold sentence “Sign And Date The Form Here” The Principal must sign and print his or her Name, provide his or her Address, then enter the “Date” he or she is signing this document. Below this area, there will be a set of lines for the “First Witness” and a set of lines for the “Second Witness” to sign his or her Name, print his or her Name, enter his or her Address, and record the Date he or she signed this form. Note: Each Witness should sign this form on the same Date as the Signature. The “Notary Acknowledgment” section has been provided in case the Principal has this signing Notarized. While not mandatory, it is strongly recommended. The rest of this form should be filled out by the attending Physician, Physician Assistant, or Nurse Practitioner.